The moving average measure, which smooths out the volatility, is 1.34, well above average. (“zero” indicates average growth over the 1990-present period). All sectors covered contributed positively to the measure with particularly strong numbers in the household sector. The Oregon Department of Employment revised employment estimates for last year, the impact of which smoothed the pattern of activity in this measure while retaining the qualitative story that the Oregon economy gained steam in the latter half of last year. 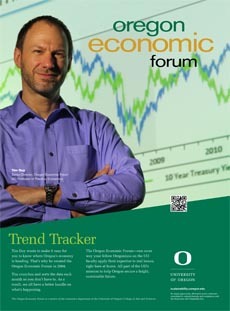 The University of Oregon Index of Economic Indicators also rose in January, gaining 0.2 percent. Similar to December, initial unemployment claims again fell to a fresh low while employment services (mostly temporary help workers) rose. These indicators suggest that labor markets remain strong even as the economy approaches the ninth anniversary of this expansion. Building permits (smoothed) were effectively unchanged for the month at a level consistent with previous expansions. Consumer confidence also held nearly steady at a high level. Hours worked in manufacturing and new orders for core capital goods fell slightly, but the Oregon weight distance tax rose to a new high for the cycle, indicating continued growth in Oregon’s traded-goods sectors.